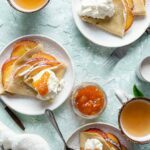 Peach Crepes made with delicate pancake batter, filled with fresh peach slices, topped with cream and peach preserves! A classy take on the traditional pancake breakfast. Add almond milk, flour, eggs, butter, vanilla, and salt into a blender (I used my Nutri Bullet). Blend until smooth, about 8-10 seconds. Pour into a medium bowl, cover with plastic wrap and refrigerate for an hour. To prepare whipped topping, place mascarpone into bowl of stand mixer. Whip on medium for about 1 minute until smooth. Slowly pour in heavy cream, honey and vanilla, mixing until light and fluffy. Transfer to air tight container and place in the fridge. Place an 8-inch skillet over medium heat. Coat pan with a thin layer of oil or melted butter. Pour ¼ cup of batter into the pan and immediately begin to swirl pan to coat the bottom with an even layer of batter. Allow crepe to cook about 30 - 40 seconds until top edges of crepe are begin to fold in and golden. Flip crepe to the opposite side and cook an additional 10-20 seconds. Repeat with remainder of batter, possibly adding another coat of butter to pan after 4-5 crepes to prevent sticking. Place baked crepes in a warming dish or a covered plate to retain heat. Assemble crepes by adding filling, folding or wrapping the sides into desired shape. Top with mascarpone cream and dust with powdered sugar.